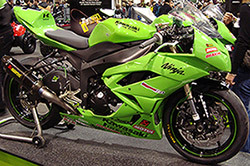 Attention all Domestic and Import Motorcycle Owners: Do you own a Harley Davidson, Suzuki, Kawasaki, Honda, Can-AM, Ducati or other make of motorcycle? 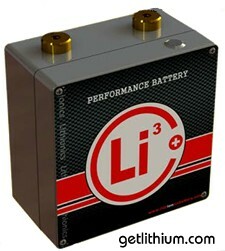 We have the Best Battery Solution for You! Blue skies, endless trails and road trip vacations � so much comes to mind when you're thinking about investing in a motorcycle or dirt bike, but your battery probably isn't one of them. Whether you're looking for recreation or competition, battery problems can ruin a great day and can leave you stranded. 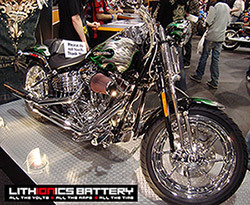 Soft lead conductors in batteries simply cannot withstand the vibration, shock and pounding of jumps, bumps and g-forces experienced by your motorcycle. Many motorcycles in Canada are stored over the Winter and if your lead-acid battery is not stored correctly, it can leave you stranded come Spring. 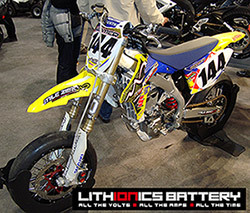 Lithionics Battery lets you get more out of your motorbike and we help you do more of what matters most: having fun! Rev up the fun with one of our batteries and experience faster engine starting, brighter lights and increased maneuverability. Whether you're going for a burn up the mountain or a road-trip to Vegas or Florida, you'll get the most out of your motorcycle by spending less time on the sidelines due to the near-50% increase in life expectancy of our batteries. No more worries about a bike that won't start. No worries about its durability in extreme conditions. just 2 to 3 pounds! for Ducati motorcycles - only 600 grams! Oh, and did we mention longer alternator life, 30% higher RPM's during engine-starting, and a hotter ignition spark? Race vehicles have sophisticated electronics and telemetry systems�systems that are damaged by 'voltage sag' during engine crank (especially a hot engine and a hot lead-acid battery.) 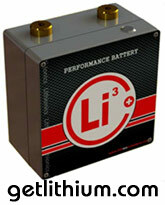 We guarantee our batteries will not sag system voltage below 10.8 volts in your high-performance motocycle. And, our exclusive, new, dual-voltage battery has two terminal taps� 16 volts for the starter motor, and an isolated-dedicated 12 volt supply of pure energy. 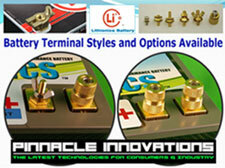 Truly, the best of both worlds, leading to faster-restarts and higher system reliability and durability. For conventionally mounted batteries in motorcycles, you may notice a lower center of gravity from our lithium ion batteries. This will translate to enhanced handling in all motorcycles and the increase in handling will be even higher in motorcycle racing as well as other motorsports racing where the driver's weight is close to the weight of the racing machine. 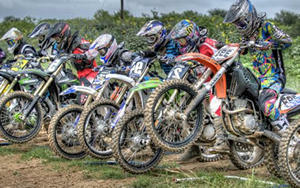 In MotoCross Racing, the reduced weight will also likely cause the rider less physical fatigue over the duration of the race. 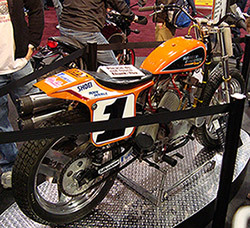 In all competition motorcycles, the reduced weight will also give you a positive increase in acceleration. Accelerating early and hard out of corners or off the line is one of the proven strategies to winning races. *Add $129.00 CAD for Push Button NeverDie System . * All Prices Subject to Change. Shipping charges included FOB Vancouver.